Feral camel populations are increasing across Australia, and are estimated to be doubling in size every 9 years. They cause over $10 million damage each year and impact on environmental and biodiversity values, as well as damaging culturally significant sites. They have even caused local extinctions of palatable plant species, and damage pastoral enterprises. Feral camels roam across vast areas of rangeland that incorporate many different tenures, including Aboriginal Lands, pastoral and mining leases, conservation lands and other Crown Land. They are highly mobile and move to where resources are most abundant. Identifying where camels occur is a very important step in their management. Feral camel density determined from aerial surveys between 2002-07. 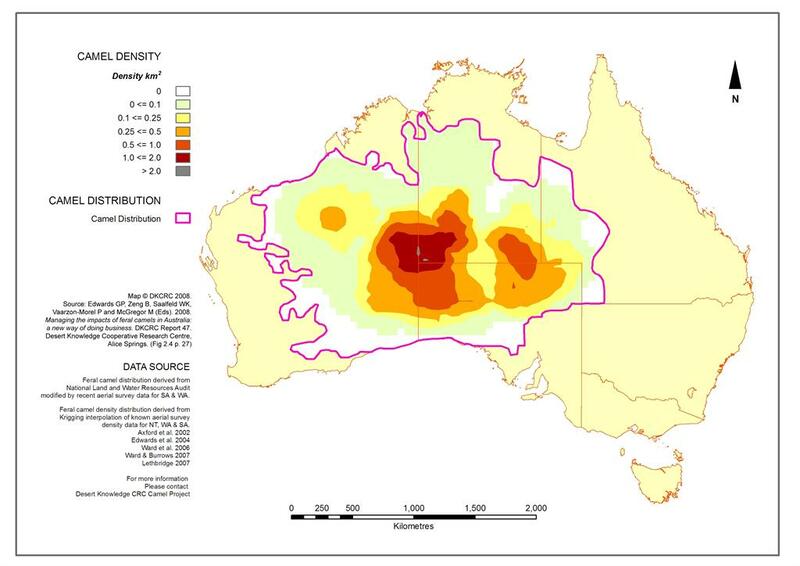 Aerial surveys conducted in WA, NT and SA between 2002 and 2007 revealed that feral camels occupy a wide range of about 3.3 million square kilometres, and are most abundant in the centre of their range (see map below). However, feral camels are highly mobile, and it is vital that this information is updated with sighting data gathered on the ground or from light aircraft. Camels can move across vast areas in a relatively short timeframe, and where they occur can change on a weekly basis. It is critical to have up-to-date information on where feral camels occur to manage their numbers. Can reach speeds up to 65 kph in short bursts, and sustain speeds of up to 40 kph. Males reach sexual maturity 5-6 years. Females reach sexual maturity 3-4 years. Breeding season in winter, with rut from May to October. Gestation 360 - 380 days, breeding interval 18-24 months. Single young weaned 19 - 24 months. Foot has only two toes that spread widely as an adaptation to walking on sand. Can tolerate high ambient temperatures, and can survive extended periods without water. Sources of information: Camel Fact Sheet: Dept. Sustainability, Environment, Water, Population & Communities. and Strahan (1995). Mammals of Australia.